Discover the inspiring tale of Desmond Doss, the World War II medic who saved 75 lives all while risking his own. If you were to call him a hero, Desmond Doss would’ve likely corrected you. The young World War II medic who singlehandedly saved the lives of 75 American soldiers on the Maeda Escarpment of Okinawa in 1945 would say only that he did what was right — that he never carried a weapon of any kind because he was in the business of saving lives, not taking them. Last year, the Academy Award-winning film Hacksaw Ridge brought Desmond Doss to the attention of countless people who’d heard neither the man’s name nor his incredible story ever before. From a young age, Desmond Doss (born February 7, 1919) radiated the kind of empathy that he’d display as a soldier later in life. When he was a child, for example, he once walked six miles to donate blood to an accident victim — a complete stranger — after hearing about the need for blood on a local radio station. A few days later, Desmond traveled down the same long stretch of road to give more. Also at a young age, Doss developed a hatred of weapons that would persist throughout his life, even during his time in combat. Doss’s hatred of weapons stemmed from watching his drunken father pull a gun on his uncle during an argument, and from his religious beliefs as a Seventh-day Adventist. His mother managed to confiscate the .45 pistol from her husband and told young Doss to run and hide it. He was so shaken, he vowed that was the last time he would ever hold a weapon. Instead, Doss spent his childhood doing things like flattening pennies on the railway near his Lynchburg, Virginia home and wrestling with his younger brother, Harold. He said that Desmond wasn’t much fun to wrestle with because you could never win — not because Desmond was particularly skilled, but because he’d never surrender and didn’t know how to give up. Years later, this physical resilience is what helped enable him to earn the Medal of Honor. At age 18, Doss dutifully registered for the draft and worked at a shipyard in Newport News, Virginia. When World War II broke out, Doss jumped at the opportunity to aid the cause. 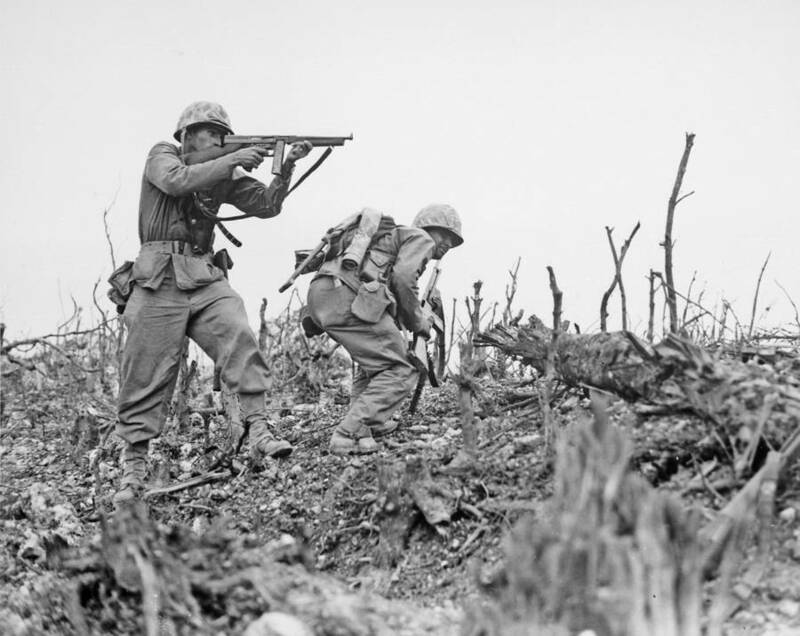 Marines in combat during the Battle of Okinawa. May 1945. But the fact that he refused to carry a weapon — let alone kill anyone — earned him the widely unflattering label of “conscientious objector.” It was a label that Doss hated, and instead of flat-out refusing to perform military service, he insisted that he work as a medic. The Army assigned him to a rifle company instead in hopes that he’d just leave. “He just didn’t fit into the Army’s model of what a good soldier would be,” said Terry Benedict, a filmmaker who made The Conscientious Objector, a documentary about Doss in 2004. Doss appealed the Army’s decision up through the ranks until they begrudgingly made him a medic. But his fellow soldiers in training camp still couldn’t understand why Doss was there. They teased him mercilessly to “man up” and carry a rifle. They launched their boots at him while he prayed by his bunk at night. They hated him for getting a pass on the Sabbath because to work on the holy day was against his religion — never mind that the officers gave Doss all the worst work to complete by himself on Sundays. Nobody wanted to be friends. Friends had each other’s backs. Without a defense weapon, the others insisted, Doss was useless to them. Yet, over and over, Doss not only dismissed their cruel behavior, he rose above it. He resolutely believed that his purpose was to serve both God and country. All he wanted was to prove those two tasks weren’t mutually exclusive. 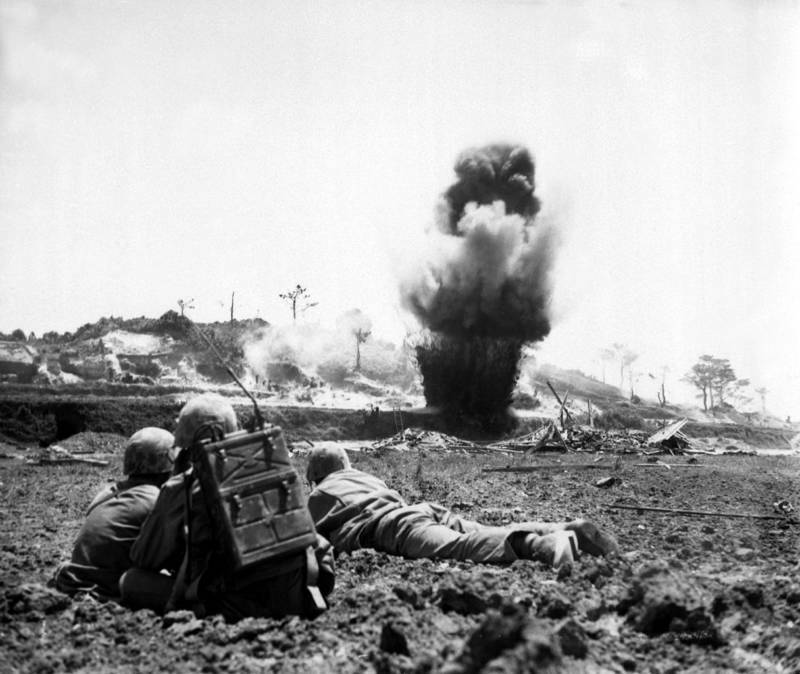 Marines destroy a Japanese cave during the Battle of Okinawa. May 1945. Then came the battle at the Okinawa Maeda Escarpment, or what the Americans called “Hacksaw Ridge.” It fell on May 5, 1945, a Saturday — Doss’s day of Sabbath. It was a particularly grueling onslaught with artillery coming so fast and furious that it was literally ripping men in half. The Japanese army’s plan of waiting until all of the Americans reached the plateau to open fire created a devastating amount of wounded soldiers. But the Japanese didn’t know that the Americans had Desmond Doss. In an act that still astounds the surviving members of Doss’s company today, the fearless medic held his ground at the plateau. Amidst never-ending gunfire and mortar shells, Doss treated the wounded American soldiers that others may have left for dead. Hour after hour, as explosions rang constantly in his ears, he tied tourniquets. Covered from head to toe in blood not his own, he crawled and dragged each hurt member of his company to the edge of the ridge and carefully lowered them down. For more than 12 hours, Doss labored under fire and saved an incredible amount of human lives. Knowing that some Japanese soldiers sometimes tortured wounded U.S. soldiers, Doss refused to leave a single man on top of the ridge. Not only did Doss leave no man behind, he also — miraculously — escaped with his own life and avoided any serious injury. Doss always claimed that God spared his life, and according to The Conscientious Objector, Japanese soldiers repeatedly had Doss in their sights only to have their guns jam. Two weeks later, Doss was in battle again a few miles away from the escarpment when a Japanese grenade landed in a foxhole containing Doss and some of his patients. He attempted to kick the grenade away, but it detonated. Doss ended up with deep shrapnel lacerations all down his legs. He treated himself for shock and dressed his own wounds, rather than having another medic emerge from safety to help. Five hours later, someone finally did arrive with a stretcher. As soon as Doss saw a soldier in need, he rolled off, surrendered his stretcher, and started patching up his comrade. Doss then crawled 300 yards to the aid station without accompaniment. He didn’t realize it then, but he’d lost his Bible on the battlefield. 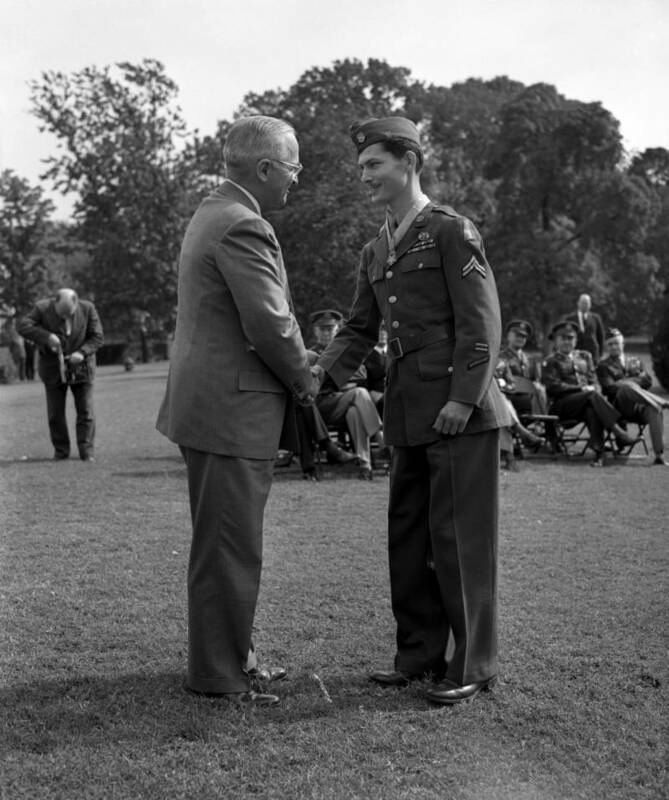 Desmond Doss shakes hands with President Harry S. Truman after receiving the Medal of Honor during a ceremony at the White House on October 12, 1945. The commanding officer also brought Doss a gift: a slightly burned, soggy Bible. After the U.S. captured the area from the Japanese, every able man in the company combed through the rubble until they found it. Forever marked by the scars from that very day, Desmond Doss lived to be 87 years old. But he will continue to live on as the man who once saved 75 lives, all while risking his own.